The first acts for next year’s Cropredy festival have been confirmed, with Marillion and Richard Thompson leading the list. The annual event, hosted by Fairport Convention, will take place on the weekend of August 10-12 in 2017 – and it’ll also mark five decades since the band’s inception. 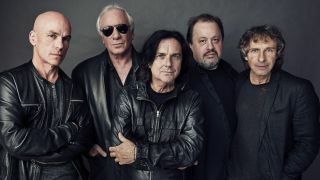 Fairport Convention say: “Returning by popular demand, we welcome back prog rock giants Marillion. The band, with perhaps the most loyal following on the planet, just don’t stop touring and are currently on the road promoting their 18th studio album F.E.A.R. “We know we don’t need to tell you that Richard has received lifetime achievement awards on both sides of the Atlantic, a prestigious Ivor Novello Award, and in 2011 was presented with an OBE – but it’s nice to be reminded. Marillion Sell Out Royal Albert Hall In Minutes! Other artists confirmed for the festival include The Divine Comedy, Dougie MacLean, Show Of Hands, Pierce Brothers, Cats In Space, Gigspanner Big Band and Gerry Colvin. Pre-Christmas ticket deals are now on offer via the Cropredy box office, with the first 1000 buyers receiving a Christmas card signed by the band, and the first 2000 receiving a souvenir car sticker. All UK orders are guaranteed to arrive in time for December 25. The box office closes at the end of the week, reopening on February 1.